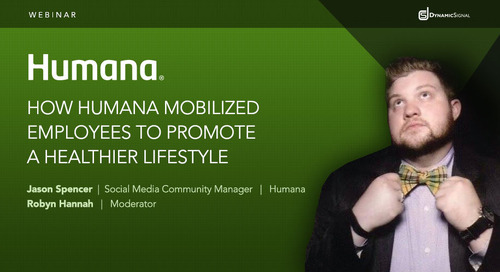 Sign up to unlock all Dynamic Signal content! Hitachi Data Systems (HDS) uses data to power the digital enterprise for better business outcomes. One of Thomson Reuters “Top 100 Global Innovators”, the company is reshaping how businesses work. In recent years they have transformed their company digitally, with a focus on their people and social innovation. An early adopter and pioneer within the social selling and employee advocacy categories, HDS has established their employees as thought leaders, and better informed their partners, and the public. By activating their workforce the company and their employees have become more informed, efficient, and highly visible as subject matter experts in their industry. GoDaddy’s Heather Dopson reveals the five secrets to designing an Employee Advocacy program that benefits both the business and the workforce. In this webinar Mark Ragan, CEO of Ragan Communications, discuss what is perhaps the most significant trend in business today, activating your employees. When it comes to workforce communication, Australia-based Penske faces some big challenges. In this on-demand webinar learn how Penske uses Dynamic Signal to keep employees informed and engaged. Kevin Spain, General Partner at Emergence Capital, discusses the company’s provocative new report, The Rise of the Deskless Workforce in this engaging webinar with Dynamic Signal. The leading global management and technology consulting firm, Booz Allen Hamilton, has seen phenomenal adoption success since introducing an Employee Communication and Engagement Platform. Want to Reach Your Employees? Go Mobile! Sutter Health’s communications team will share their journey in launching and sustaining a mobile app for their employees, plus lessons learned along the way. Michael Brito, from LEWIS Global Communications and Robyn Hannah from Dynamic Signal, discuss the future of workforce communication and how CommsTech is finally catching up. Highly trusted employees can be an organization’s greatest asset during times of digital transformation. 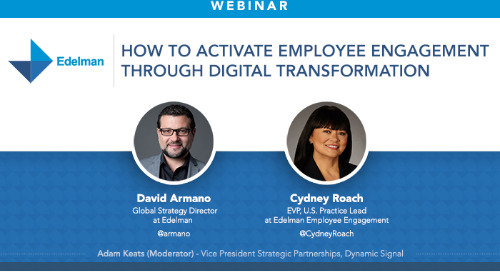 David Armano and Cydney Roach from Edelman explore how to activate employee engagement. 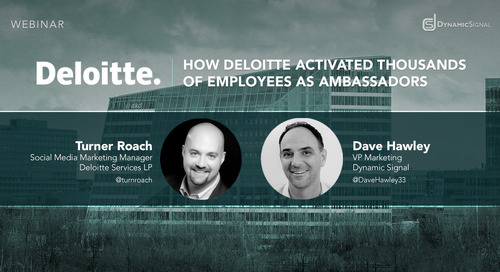 Deloitte has engaged thousands of employees to advocate for the brand on social media and build their personal brands by empowering them to share company and industry news and content. In 18 months, Vodafone's employee advocacy program has expanded to almost 2,000 employees, who have shared over 50,000 pieces of content, driving over 30,000,000 impressions for the company. Kristian Lorenzon, Head of Social Media at O2, a leading digital communications company in the UK discusses how the company engages their deskless workforce at global scale. Through their employee advocacy program with Dynamic Signal, Softchoice empowers their employees to use social media to generate leads, recruit talent, and grow their professional brand. Sonia Boije and Lisa Smith-Strother from Ericsson discuss how they keep their employees more informed and engaged with Employee Advocacy.